The Washington County Sheriff’s Office has charged a Smithsburg man in connection to a burglary. On March 3, 2018, Deputies responded to a residence in the 13300 block of Sandstone Drive, Smithsburg for a reported burglary. It was reported that a Dewalt black material bag tool kit containing a 6” skill saw, an angle grinder, a reciprocating saw, two (2) batteries, a STIHL chainsaw and an 18 volt cordless drill were last seen in the garage on February 19, 2018 and now were missing. The victim stated that the doors to the garage had all been closed; however, none of the doors were locked at the time. There was also no damage to the garage itself. 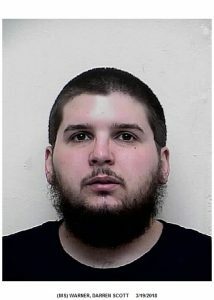 During the course of the investigation Deputies learned that a Combo Kit Tools Dewalt , Drill/Impact Driver, Reciprocating Saw, Grinder, 3 Batteries, and Charger in a black and yellow bag had recently been pawned by a male identified as Darren Scott WARNER, 24, of Smithsburg. On March 19, 2018 Detective with the Sheriff’s Office located Warner and placed him under arrest. Warner has been charged with 2nd Degree Burglary and 2 counts of Theft. Warner is currently being held at the Washington County Detention Center. Residents in the Smithsburg area, who have had lawn equipment or tools stolen recently are asked to contact Lt. Alton at 240-313-2185.